Remember there are no jokes about Jonestown because the punchlines were too long. If there is no punchline in this strip then it becomes funny – thus making the last line a punchline. But then the joke no longer works so it’s not a punchline – and the joke is funny again. I added a comment to the last strip regarding UPOTWA, but it was unaccountably held up by the system (thanks, Author, for fixing it). As this is a serious matter for all regulars, I recommend that you go back and read it. Denying everything with an illogical croak. Sam+Huff, that is terrible…and hilarious. Props. I’m still reading, just not commenting much. …and off is a TV channel. …and abstinence is a sexual position. Author is the Michelangelo of irony! machigai – sorry, my mistake, i thought you were someone different ;-). Herman – the problem is with your analogy is that zero is, without doubt, a number. It’s certainly much more a number than atheism is a religion. Brilliant yet again, Author. I must find a new superlative to use for your efforts. But what DanCJ said. Dear HaggisforBrains, I realize that I left my comments on the previous strip where you left a comment about UPOTWA. Sorry to have you chasing it. You haven’t actually read the book, have you? Thought not. 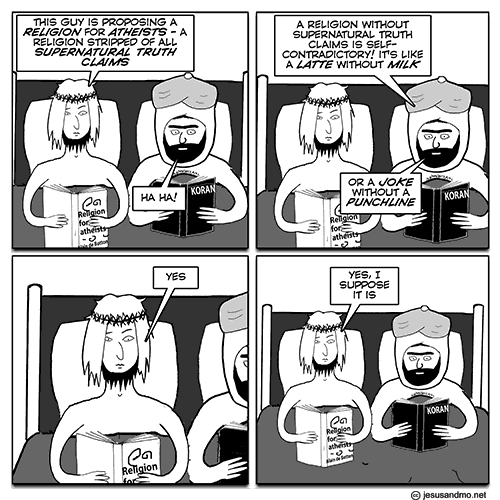 Mo, of course, would not be able to cope with non-theistic spirituality, so his “latte without milk” comment is fair enough, and characteristically Islamic. But Jesus is nonplussed … which may be because you are dimly aware of various “post Christian” groups and individuals (I would include Dan Dennett here) who may be as atheist as they come but don’t therefore despise everything to do with religion. 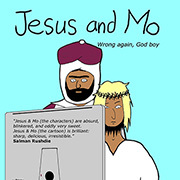 I’d like to see Jesus and Mo pop along to a Sunday assembly and see what they make of it (http://sundayassembly.com/about/). Not asking you to be respectful, that’s not what J&M is about, but there is such a thing as being properly informed, which in fairness you generally are. This is one of your sloppier efforts. No, you’re right, I haven’t read ‘the book’ – if you are referring to the Alain de Botton ‘Religion for Atheists’. I got as far as page 3; …it must be possible to balance a rejection of religious faith with a selective reverence for religious rituals and concepts. No, it mustn’t. Next. Since we spend so much energy at the C&B patiently (and even wittily) explaining that atheism is not a religion, you can’t expect the regulars here to be imbued with enthusiasm for a project that seeks to turn it into one. various “post Christian” groups and individuals … who may be as atheist as they come but don’t therefore despise everything to do with religion. That ‘despise’ is something of a pre-emptive strike; is that how you see us? If what you are doing has no ideology, no dogma, no leadership and no supernatural focus, how are you any different from any group of people, say, sitting around in a pub? And as for your accusation of sloppiness, short of your fantasy requirement of J&M somehow joining in with your desperate sociology, exactly how could the strip have been tightened up? What, have we attracted another one? Is it time to once again invite a troll to trundle away whilst indulging in self gratification or an impossible bit of tantric contortionism.? Mary2, you decide. I’m biting my tongue. I’m okay with some Christian rituals. and the chocolate eggs … produced by that Rabbit at Easter. … like bald is a hair colour. *hotrats* – not at all relevant to this thread, but “Banned from Utopia” at Camden Jazz Café in December. You know it makes sense. I tried to book my village hall for an atheistic religious meeting, but unfortunately found that it was already booked by the Round Earthers Society. Nice to see UPOTWA getting a mention; it’s been a while. As one of the Founders (and, if memory serves, the originator of the potwa and the backlash at the ubiquitous ‘@’ – pedantic enough?) I would like to propose a potwa on the increasing and incredibly annoying use of ‘so’ as a prefix to sentences, an irritation that I’m glad to say is little in evidence around here but is otherwise spreading through the language like verbal chlamydia. Suffolk blue – “Round Earthers Society” – Neat 🙂 🙂 (having trouble getting smilies to work just now). AoS – I guess that you, like me, belong to the “Grumpy Old Gits™” faction of UPOTWA. I tend to agree about “so”, so used. However, think back, is it any worse than “well”, which it seems to be replacing. Really it’s just a placeholder while the speaker formulates the next few words. Discuss. BTW, full credit to you for inventing the potwa, and stopping me from using “@” when addressing others on this site. “Verbal chlamydia” – I intend to steal that one! Ah, both types of smiley worked this time (with and without the dash) :). Oh dear! Testing smilies with dash :-). Without dash :). Wink with dash ;-). Wink without dash ;). Perhaps I should get a life. And where do you stand on the Irish “hanging so” at the end of a sentence? Suffolk blue – I actually find that quite quaint, but only if spoken with a Southern Irish accent. I *hate* the High Rising Terminal, also known as the Australian interrogative, often heard in Ulster, and becoming increasingly popular among the younger generation here. /Grumpy Old Git Mode. Jeez, a religion without the supernatural bits is like a cupcake without frosting. Of course, a cupcake without frosting is a muffin. Well, okay, then. I think the “Atheism is a Religion” mantra comes out of the U.S., from people who also equate the Theory of Evolution and other sciences that are seen as opposing their own religion with the “Religion” of atheism. The reason? Because of repeated court rulings that religion can’t be forced on students in public schools. Get Atheism officially recognized as a religion and the fight is on to keep those sciences out of public schools as they “aren’t science” but part of a religion, just like intelligent design. The evangelicals see this as a good thing because then when they try and convert people only educated in public schools they know nothing of the sciences that show the nonsense of many of their religious myths. They can be convinced more easily of many of the falsehoods spread about these sciences (like the crocoduck “missing link”). Sneaky and deceitful. But all too typical. UPOTWA? I might have to start reading the archived comments. Muffin the Mule – I understand that this is illegal in some countries. Smilies are like atheists. They flourish when give some space and resist being confined with traditional delimiters. Haggis, that is the most unmulish mule ever. It’s also not a muffin. It is quite strange, however. But not supernatural, so I suppose it could qualify. must be possible to balance a rejection of religious faith with a selective reverence for religious rituals and concepts. Sort of like Thomas Jefferson’s bible? I am not a spammer. I’m not a spanner, either–thought I’d say that, just to throw a wrench into the works. Hotrats 🙂 I hoped someone would feed the punch line! Well, if you like choral singing enough, it is possible to ignore the religious content of the sentiments expressed; staunch atheist Brian Eno is known to be an enthusiastic member of a gospel choir, appreciating the spontaneity and sense of participation while having no sympathy with the lyrical content. In short, the religious element is irrelevant. When it comes to the beauty of any ritual, I am reminded of Abraham Lincoln’s ‘people who like this sort of thing will find this the sort of thing which they like’. Tea ceremonies, coronations, holy communion, and the State Opening of Parliament have no value or impact beyond the attitude of the participants, which it is certainly possible not to share. I’m not a spammer either. Bloody Vikings. …or Lobster Thermidor au Courgettes served in the Provençale manner with shallots and aubergines with a truffle pâté, brandy sauce and a fried egg on top and Spam. Cooked courgettes are dreadful, with or without thermidors, or, for that matter, matadors, car doors, corridors or open doors. Aubergines are, quite frankly, repulsive. They are repulsive even if not being quite frank, or any sort of frank. Even furter. And I have at least two levels of spam-blocker. I have tried it. It’s about as nice as condensed camel emesis. No, on further consideration, spam is very much the lesser in niceness. Truffles aren’t very nice, either. I never did get the attraction of those. Shagging arsenic grout, as they never said in Korea, right? In an elderly house, my dad once cooked me smoked-steamed whole lobster using real wood smoke. He cannibalised his front door for the fuel. It was delicious. The lobster, not the door. He was a very strong man and shredding a door into kindling and sticks wasn’t a great effort for him. Hmm, lobster … I think I’m hungry. What’s the difference between>i> lobster thermidor and a pint of grouting? I had a thermidor once, ages ago, I may still have it somewhere in this museum of a house. I kept cigars in it in the period I smoked such things before I smoked the specific cigars I was keeping there (after I’d smoked them, I kept some parts in the tar in my lungs and other parts in the ash trays). I think it was a present. Or a past. Probably a past present. Or was that a humidor? I can’t imagine it was a toreador, as that would have been a bit bullish and would have made my pockets fullish. I just thought I’d mention it for those who are still wondering. Aaaah, too many greater-thans and no slashed-i-in-angle-brackets. The “lobster thermidor” was supposed to be “lobster thermidor” but I was missing some key ingredients. Mostly the cheese, brandy, lobster, thermidor and cooking. I think I do have the pepper. Y’know, it’s a general rule that when you criticise some idiot’s gramma’, punctuation, spelling or HTML tags (even your own) you make a mistake in the critique. “Being a ponce” comes to mind. Yes, I know about the “a”. I have been in a kitchen. One of the most beautiful pieces of music I ever heard was a male ensemble singing the Russian (or Soviet?) national anthem. Without knowing a single word of the language that is truly soulful. Not so much when translated into English, though. Another was the Mormon Tabernacle Choir doing “Silent Night” and a whole lot of other stuff related to snow, Winter, cold and other nightmares. Even knowing the language, as I do, them guys made it seem magical. And, while I do not get sport at all and have no great feelings towards forming a country from England’s more northern shires, the annual Murrayfield choir is awesome. The more Welsh one is almost as stirring. Even in Welsh. Here is a small moral dilemma to think on on a Sunday morn, should a non-deluded, non-believing infidel heathen who is utterly convinced there is no afterlife of any sort, toast the destruction of such a thing as this man? Or should we lament, however minimally, the loss of any thinking being, or even living being? His crimes, if any, matter because they hurt other living, thinking beings but should we vilify him any more? Or should we just be heartily glad that no remnant of him exists any longer? That there is no soul to punish or ghost to summon? And should his victims divvy up his ill-gotten gains? Not that the wan… bankers would make that easy to do. ‘A Wigwam for a Goose’s Bridle’ is a way of not answering an unwelcome question, especially from inquisitive children; the point being that geese don’t need bridles, and bridles don’t need wigwams. ‘Wigwam’ seems to be an Australian corruption of ‘whim-wham’, meaning a trinket or frivolous item – probably from ‘whimsy’, just as ‘flim-flam’ comes from ‘flimsy). The phrase ‘A whim-wham for a goose’s bridle’ has been an English folk-saying since the 19th century. I first came across the ‘wigwam’ version from reading Clive James, who has often used it to mock anything important-sounding but ludicrous – his example being the Council for Social Democracy. Thermidor was one of the summer months in the French Revolutionary Calendar. The other two were Messidor and Fructidor, which never got their own lobster recipes. I’w gymharu a’m Iesu Mawr. O, am aros! O, am aros! “Silver loonies gild the lawn? “One in gluteus disabling foes. It’s a lot easier to do this sort of thing when you don’t know the tune and have no idea how the scansion should work. “Thermidor” does appear in some rather elderly French poetry. Not often, but it has been known to happen. Some poets will write anything to keep their cervical vertebrae connected. Misappropriating the term and misusing it to refer to an entirely imaginary example of kitchen-ware was, I thought, witty. Further abusing the term was probably bathos to some degree. Explaining the joke is sad. Explaining the joke just so everyone knows the mistakes were deliberate is highly sad. And possibly a sign of a deep-seated insecurity, which, of course, I don’t have. Unless this, too, was for comedic effect? Jokes without punchlines? That’s life. Oh my gods, Empiricist, you’re right. Life is a joke without a punchline. Great to compare my Jesus. Oh, want to stay! Oh, want to stay! His girlfriend in the days of my life. , this is a better copy of your little ditty. But why would you suggest it would be NSFW? Surely it expresses every basic sentiment of the prevailing Judeo-Maryan culture that surrounds us? Bosses and priests should welcome this being played over the PA. Repeatedly. From a hack. Not that I’d suggest such a thing. Is a truthy, truly true tale of genetics and sociology. It is so very true. And just to show that legends can be human we have this. Spinal shivers in sonic form. Empiricist, can I have some, too, please? Hotrats: A wigwam is a light shelter made of branches & bark by the natives of eastern Canada. Go halfway down the page. Well, I love some of the architecture, quite a bit of the music and the King James Bible has many a well-turned phrase. But as for the woo – the less said the better. Sorry to disagree Blackflag but it seems to me more of a hack writer or sub editor trying to kick up a storm. I would want to know a lot more about Cox and his beliefs before taking a couple slightly out of context quotes as a genuine pointer. This is fairly typical of a lot of journalists, editors. The headline refers to a very small part of the interview, almost an aside, while the question of god is thrown in also somewhat out of context. My first thoughts on reading this was it was more an agenda of the journalists involved to try to force him to say something controversial. Religion and religious controversy sells. I too think making a sweeping statement without adequate evidence or reasoning is naive, whether it is about religion, physics or whatever. While I am positive in the non-existence of gods I cannot prove it and have no intention of trying to as I think the evidence against is overwhelming, whereas religionists think they have proof in man-made books of dubious origin. It would be interesting to know if Prof Cox qualified his statement, as a good scientist I think he may well have done, but that qualifier would have made the quote less sensational and, as such, less of a turn on for sensation seeking journalists. That no considered point of view should be dismissed out of hand is a perfectly fair point; and coming from a well-known atheist, a generous acknowledgement of the need to make the case for a cosmological rather than a supernatural perspective. Hardly a ‘hornet’s nest’ comment. I’m looking forward to the show. I guess what I said was open to misinterpretation; my bad. I was referring to the BTL stuff rather than his remarks per se. Theists and atheists having a bit of a ding-dong. It is interesting, however, that he references two theistic philosophers of the 17th and 18th centuries, who have been the subject of much serious critical work later on. Schopenhauer, Nietzsche and Russell in particular, come to mind, and none of them were idiots either. For every ‘big name’ on one side of the argument, there are equivalent big names on the other. Besides, Cox’ point seems to be uncomfortably close to an argument from authority – these guys were clever bleeders, so we need to listen to them. I would say, yes, they were indeed clever bleeders, but they were products of a specific cultural context – a time and a place. They took supernaturalism seriously because the culture they lived in took it seriously. I do not live in such a culture, and I don’t take it seriously. Hotrats, I don’t believe ‘wigwam’ is Australian for anything. I have always heard the word used to describe the tent or tee-pee of Native Americans. Wigwams and tipis are completely different structures used by completely different cultures. Should anyone ever ask why superstition and religion are such bad things, we do not need to point to their evil or their evil effects, all we need do is mention this. Sure, there are Savilles and others who do worse for their own pleasure with absolutely no connection to superstition or religion, but without those influences there would be one fewer class of torturer. And possibly fewer damaged children. The least we would have is that all damage to children would, without religion, be unlawful. None would be covered by colour of godly authority. Sorry, my own poor choice of words. ‘Wigwam’ is not a corruption of ‘whim-wham’, which would mean a newly-coined word, it is a folk etymology, a change in a word or phrase over time, resulting from the replacement of an unfamiliar form by a more familiar one. In this case, ‘wigwam’ was the more familiar term, probably from popular tales of the Wild West. TePe’s are those little brushes for the gaps between the teeth. I had no idea they were invented by Native Americans. We already have a church of realistic truth claims.